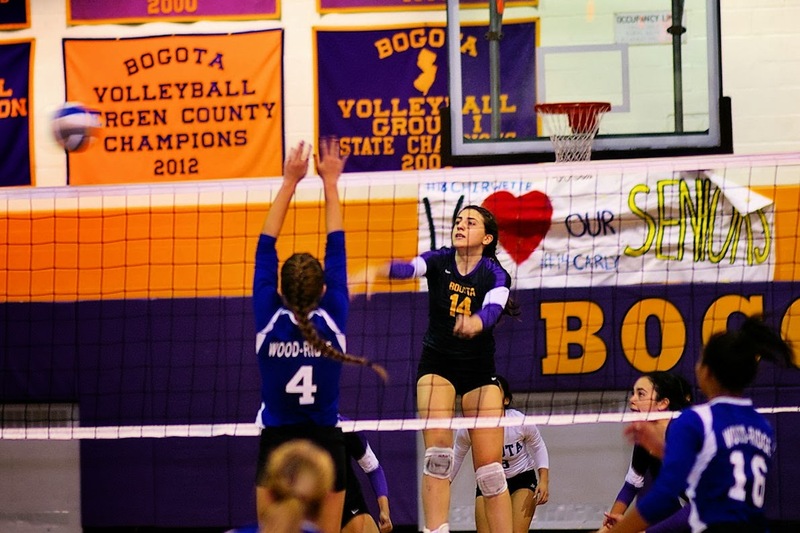 On Tuesday the Bogtoa Lady Bucs Volleyball team moved into the Semi- Finals of the NJSIAA Group 1 2013 Tournament. 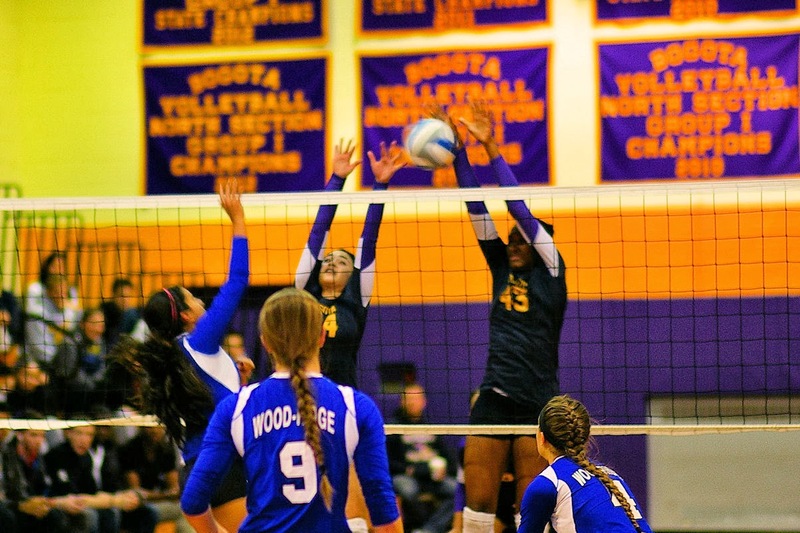 # 1 Bogota defeated the #9 Wood-Ridge Lady Blue Devils 2-0 (25-11: 25-7) at Speary Gym. Wood-Ridge kept the Lady Bucs even for the beginning of the first game having had a 3-1 early and tied the game at 7. 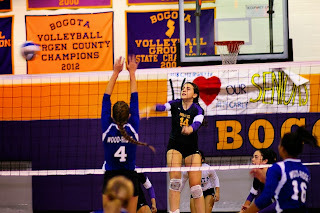 Bogota's Carly O'Sullivan then used a string of 11 straight serves which Bogota was able to convert into points built a 18-7 lead and never trailed in the match after that. The Lady Blue Devils did not not take the defeat easily, saving a number of sure points and turned them into long rallies by both sides. Wood-Ridge show focus, and hussle, even as Speary Gym itself tried to play a part in the Match. 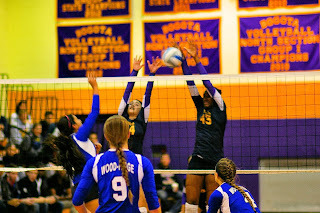 Plays that would bounce off the ceiling beams, or head to the small space between the court and the stands were kept in play by the Lady Blue Devils. Bogtoa used it's talent and experience to maintain their game while waiting for the time to strike. When Ms. O'Sullivan looked to be defended the Lady Bucs got Kills from Kelliann Brown with 8 and Natalie Torres added two more. Ms. Torres also had a match high 2 Aces for Bogota. Carly O'Sullivan had 8 Service Points for the Match to go with her 18 Kills. Amanda Manzo had 24 Assists and Jenifer Ramirez finished with 6 Digs. The Semi- Final round will again be hosted by Bogota in Speary Gym on Thursday 14- Nov. The first game will be #2 Westwood playing #3 Rutherford starting at 5:30p The next game is scheduled for 7:00p with #1 Bogtoa playing #5 Secaucus. The finals for the Group 1 Championship will be held at William Paterson University on Saturday 16- Nov. starting time to be determined later. ...and at the back line. #17 Julia Connelly serving ..
.. and setting a play.